Unless the owner brought in this Porsche 911 Turbo to test out the aftermarket rear quarter deflector shields, I don’t think this Russian mechanic’s test drive was all that successful. Especially since, according to several sources, it ended in him destroying a $220,000 Porsche. Oops. This happened near the end of May in Askay, Rostov Oblast in Russia. Reports say the driver was a mechanic at a premium-car garage who decided to take the car on a little test drive. 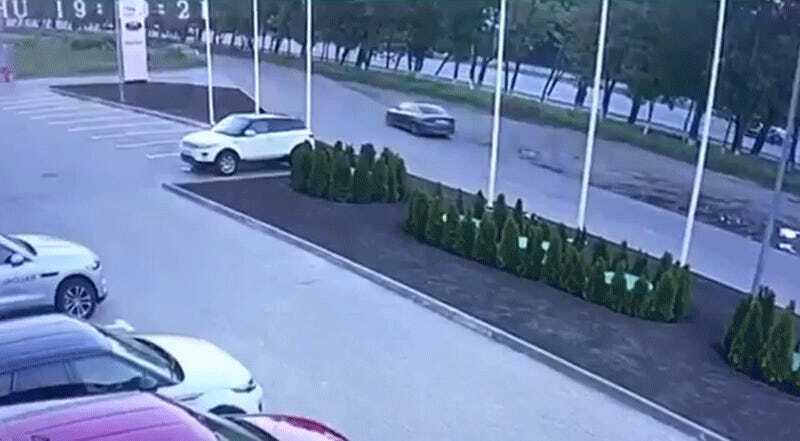 Based on the CCTV video that captured the wreck, it looks like the mechanic overcooked the curve and came in a bit wide, perhaps understeering a bit. When he saw the approaching car he got on the brakes and attempted to correct, which caused a very slight amount of oversteer. That kicked the tail out just enough to contact the other car, send him into a spin, into the wall, and, likely, cause a brutal bowel assault on his admittedly innocent underpants. Expert laundry forensic researchers who watched the video do not expect the underpants to survive.